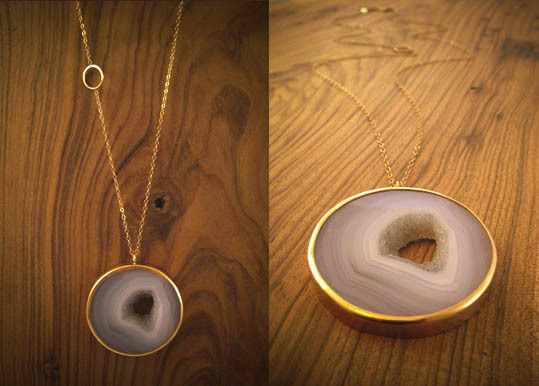 "A gorgeous and glowing agate specimen is wrapped by a 14 karat gold bezel for an impressive statement piece. Suspended on a delicate 28" 14 karat gold chain, this is a necklace you'll treasure for years. This is the last one!" (US$915.00) GIMME! PS Dear Melissa Joy Manning. You. Rock. No pun intended. Simply gorgeous. Great find. I would wear this proudly! Sportsgirl has some sweet agate necklaces in, you will have to check them out. links or possibly guest author a article for you. Here is my personal contact: walter-mckenna@gmail. com. Make sure you contact me if you're even remotely interested. Many thanks.